I recently acquired a 1946 newspaper ad that contains a number of interesting nuggets: first, the note at the bottom that Reynolds was a division of Scherl & Roth — this is consistent with a July 1946 newspaper reference to Max Scherl as president of F.A. Reynolds, the position formerly held by Foster Reynolds. It seems to be confirmed that Foster Reynolds had either left or stepped away from running the company by mid-1946. Second, note the illustration of the trumpet. While the bell is only shown from the side, the engraving style is consistent with Reynolds’ earliest instruments. For trumpets, cornets and trombones, there are two key engraving styles on F.A. Reynolds instruments, with a change occurring around SN 9000, which would be c.1942-43 by my serial number estimates. 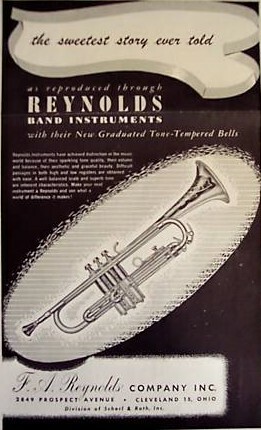 However, this is a 1946 advertisement, meaning that either an old trumpet illustration was still being used or that the change in engraving styles happened later than previously estimated. Let’s speculate that the engraving style change actually happened around the time of the ownership change in 1946. That would push SN 9000 to 1946 for an average of ~900 instruments/year in the company’s first decade, keeping in mind that Reynolds’ subsidiary Ohio Band was producing a much larger number of school-grade instruments on the same factory floor, presumably with the same workforce. Most of the Reynolds instruments that have been documented with SNs between 4000-9000 were made for the USAAF military bands – these would still fit into an appropriate time window from c.1940-46. Further, if SN 21000 remains fixed to the end of 1949 and the introduction of the Contempora brand, that would mean that the manufacturing rate increased to ~3500 horns/year between 1946-1949. 0001 1936 F.A. Reynolds name first used in commerce in February 1936. 3600 1940 Many instruments with SNs 4xxx-21xxx with the “US” bell engraving and/or documented wartime purchase. 9000 1946 F.A. Reynolds Co. becomes a division of Scherl & Roth by mid-1946. 16000 1948 The Contempora brand was introduced in late 1949 according to U.S. trademark applications; the earliest recorded Contempora instrument is SN 21025. 30000 1952 Instruments start to be branded “Made by Roth-Reynolds” instead of “Made by F.A. Reynolds”. As I’ve noted on the serial number pages, using serial numbers to identify the exact production dates of Reynolds instruments is inherently inaccurate because so much speculation is involved. All of the above is based on a specific illustration style appearing in a specific print ad on a specific date, which seems specific enough, however the caveat is that old illustrations were still appearing in Reynolds catalogs during the 1950s, making it difficult to make definite proclamations regarding manufacturing dates. This entry was posted in Updates & News. Bookmark the permalink. Both comments and trackbacks are currently closed. I received my Reynolds Contempora, Leonard Smith model trumpet in 1957.
imprint of my name “PERRIN”, which I just discovered after 55 years. Was this common for Reynolds to imprint the customer name there? My son bought the ’39 Reynolds cornet #32XX mentioned in earlier posts. We’ve had it professionally restored to manufacture status… silver bell, nickle silver valves & lead pipe… the interesting and odd thing about it is: we were told by the professional restorer that Elkhart had been consulted and it was determined the bell is nickel silver and the horn is all original. I sent photos of the cornet last week but I’d like to know your opinion… this would be at least and oddity and at best a rarity… could it be??? I have a Reynolds Contempora tuba bearing the serial number 19054, earlier than previously accounted for(?) the Contempora line. We recently purchased a Reynolds cornet S/N 32XX (only ten numbers off the one depicted in the first photo concerning Professional cornets on contemporacorner.com) but it has a solid brass finish rather than the silver and brass look of 3244 shown in the photo. Is this unusual or a normal finish for the early Reynolds? We want to have the instrument professionally cleaned and refinished but we are trying to learn all we can about it before we do so. If not, I’d definitely be interested in taking a look at photos – you can send them to photos@contemporacorner.com. Thanks! Exactly like the #1019 from what I can see… to have it restored to “manufacturer equivalency” will cost $300. Is that a reasonable investment for a piece that will be played and appreciated for several years? My maternal grandfather, Joseph Bartik, returned to the Reynolds company in December 1945 after finishing war work at Navy Park (in Cleveland). I remember seeing some of his sketches of the “new” logos, which he redesigned shortly after rejoining the firm. He is pictured on this web-site, above the heading “1950s: Roth-Reynolds”, finishing tuba bells. My grandfather had a particular trick of spinning these bells with a thin section near the center of the curve, and then finishing the rolled edge without wire, which was believed to make a better sounding instrument. He was also deeply involved in the design (for inexpensive mass production) of the cheaper grades “Ohio Band” insturments. By the fifties, though, he spent most of his time in prototype and one-off custom work. I would love to seem more photos form the series of shop pictures, if they are available. Wow! thanks for sharing the story about your grandfather. It’s great to have confirmation about the new engraving style timeframe and the insight into the tricks of the spinning trade. I would love to hear more if you have the time [admin@contemporacorner.com]. I’ve added a small gallery to the 1950s page of the three factory photos I have. They’re taken from a scan of a c.1958 catalog, so the quality isn’t great. I’ll see if I can rescan at a higher resolution and post something more legible. That certainly is my grandfather. I have a better 8 x 10 copy of that photo. Note that the photograph considerably predates 1959. I believe the original was take in around 1952 or 1953. The fellow working at the other lathe is Anton Redl, as I recall. I have a stack of unfinished trombone bells in copper, which I believe were used as shape patterns. I also have a group of nickle-silver Argenta trumpet bells, in 2 sizes. , which include 3 different engraving patterns, none of which are the production design. It appears that the firm at one point may have considered the production of both large-bell and small-bell Argenta trumpets, and that mu grandfather was asked to come up with several different decorative designs. The production design is much simpler than that of any of the samples that we have. Somewhere I have a couple of coffee cans full of trumpet, cornet and baritone keys. My father, who at the time worked for Warner and Swayze as a sales engineer remembers selling the company a modern NC screw machine at the time of the move to Texas. This replaced an ancient follow-cam machine, which was used to make keys, screws, and even mouthpieces. The automatic screw machine would manufacture compete school-grade trumpet and trombone mouth pieces, and would make blank artists grade mouthpieces which would be hand-finished.